Hello friends, I would like guidance on how to start using xafari framework. Perhaps a project, or a direction with examples help me understand better. If you want to use Xafari Framework you must download Xafari and DevExpress with corresponding versions at first. In the next step you must read the Xafari documentation. The documentation include description of functionality and Getting Started (see attached file GettingStarted.png). The Getting Started node shows how to use the feature for developer. But documentation have some mistakes. If you will have any trouble with the Getting Started node feel free contact us and(or) see tickets list. 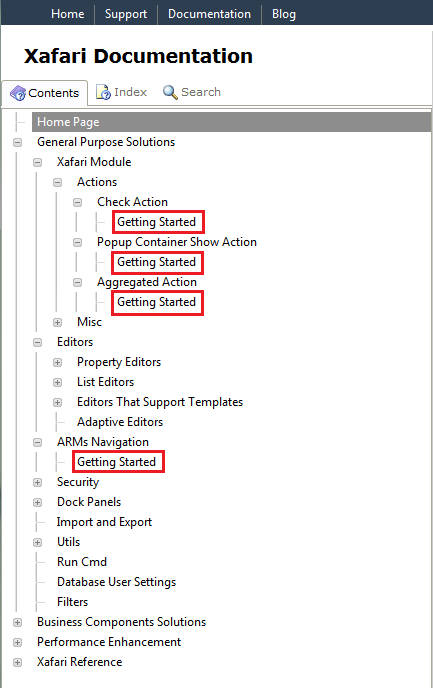 You can see example creating project using Xafari modules: attached file ExampleCreatingProject.zip. Thank you for the clarification. I would like to analyze the source code of Demo "Feature Center Windows / Web" would be much easier for me to see the features that would be useful in the company I work for. Can you provide me the project? You can view the source code Demo Center (Feature Center, Northwind, Northwind.DC, Business Components ) in the next path C:\Users\Public\Documents\Xafari Framework v... Demos. I hope this information suits for you.